Went in with friends as the excellent Coach & Horses was jam packed . 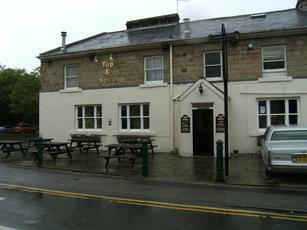 The Tap & Spile is a "last resort" kind of pub- as even on busy weekend nights its empty, so you can always get a seat . The choice of real ales is OK but the service is miserable & slow and as the night goes on the barman gets grumpier & more offensive. I have experienced the Tap & Spile (infrequently) for over 20 years- I remember it was the only real ale pub in Harrogate .There are excellent pubs in the immediate area and the Tap & Spile needs to change its attitude to customers if it does not want to remain a pub of "last resort" . We all agreed we wouldn't be going there again. Probably OK for dog owners - but the lounge does have a doggy smell to it. he was a little drunk and he has lost in my opinion a couple of good customers! Mixed experience here. Tend to agree that there were too many beers on . The Old Peculier that i had was on the turn, but the other two that i sampled were well kept. A bit of a shame as the Landlord clearly loves his ale. Would try again as everyone can have an off day. Used to drink here weekly for years despite the prices. But have only gone there rarely for the last year. I think there may be too many different beers on for the management to look after/turn over properly. A number of pints have had to be returned undrunk having sadly gone west, which, at these prices is a shame. A tally is kept on the blackboard of the number of different brews served over the years, which is commendable. But variety is no substitute for quality, and it would be preferable to settle down to a few regular gooduns, with maybe just the one new one each week. I hope things improve in this regard because decent real ale in Harrogate town is uncommon.